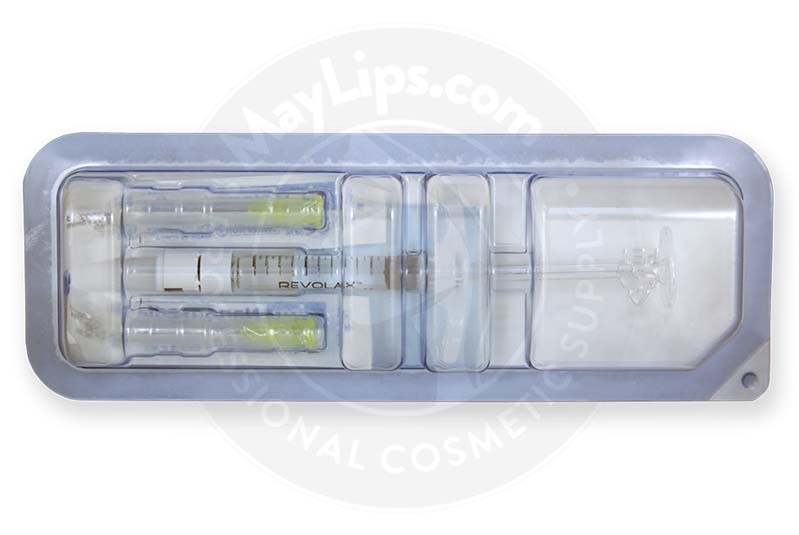 Revolax Fine with Lidocaine is a relatively new dermal filler that is made of highly pure and non-animal-based hyaluronic acid gel that is completely biodegradable. This clear injectable implant is designed by Across, a South Korean pharmaceutical company that was established in 2009. Since its inception, Across has developed various medical devices, medical instruments, medications, and health foods. Revolax, one of its renowned ranges of injectable implants, is composed of 3 different types of fillers—Revolax Fine, Revolax Deep, and Revolax Sub-Q—to correct various dermal problems. Revolax Fine is made of 24mg/mL of cross-linked hyaluronic acid gel that is integrated with 0.3% lidocaine to suppress pain during injection session. 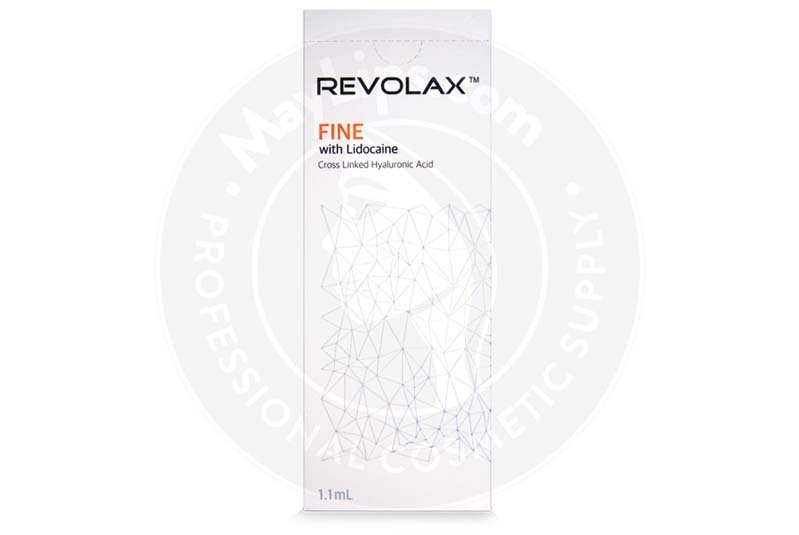 As the name suggests, Revolax Fine with Lidocaine is ideal for erasing fine and superficial wrinkles such as crow’s feet, forehead lines, and neck wrinkles. Each box of Revolax Fine comes with one prefilled syringe that contains 1.1mL of this solution, 2 sterilized and disposable 30G needles, and a package insert. This sterilized medical device has a shelf life of 24 months if it is stored in a safe place where the temperature is between 2 to 25℃. Perioral wrinkles, which are vertical lines surrounding the lip borders). This long-lasting wrinkle filler makes treated areas look healthier, smoother, and plumper. Superficial wrinkles, such as crow’s feet and forehead lines, develop due to ageing. Ageing is an uncontrollable process whose onset and severity of effects are predetermined by one’s genetics. Ageing results in the slowing down of the rate of tissue renewal and repair; these developments, in turn, make the skin lose its elasticity and cause dynamic wrinkles (wrinkles that happen during facial movements) to become permanently etched, effectively making them static wrinkles. Most of the time, the appearance of these superficial lines can be exacerbated by external ageing factors, such as long-term UV ray exposure, smoking, and pollution. If left uncorrected, these fine lines can deepen into severe facial creases that may affect one’s appearance and self-esteem. Revolax Fine with Lidocaine is composed of hyaluronic acid molecules that are derived from the biofermentation of Streptococcus zooepidemicus cultures and do not contain any traces of animal proteins. The highly purified hyaluronic acid molecules are then cross-linked with each other to form a monophasic filler gel with a uniformly dense mesh structure. This unique structure allows the gel to be delivered via smooth and consistent injections throughout the treatment session. Once injected into the superficial dermis layer, the filler instantly erases dermal lines. Aesthetic treatments done using Revolax Fine with Lidocaine must be regarded as medical procedures; therefore, patients’ medical information must be reviewed thoroughly before the injection process to ensure that they are not allergic to any of components present in the filler. Afterwards, a facial assessment must be done, and the degree of correction needed should be discussed as well. Once the treatment goals have been agreed upon and the potential side effects are explained to the patients, physicians can commence the session by cleaning and sanitizing the proposed treatment area(s). Revolax Fine with Lidocaine can then be administered into areas with fine wrinkles via superficial dermal injections. While non-crosslinked hyaluronic acid has superior biocompatibility and hydrophilicity, it is metabolised rather quickly by the surrounding tissues. 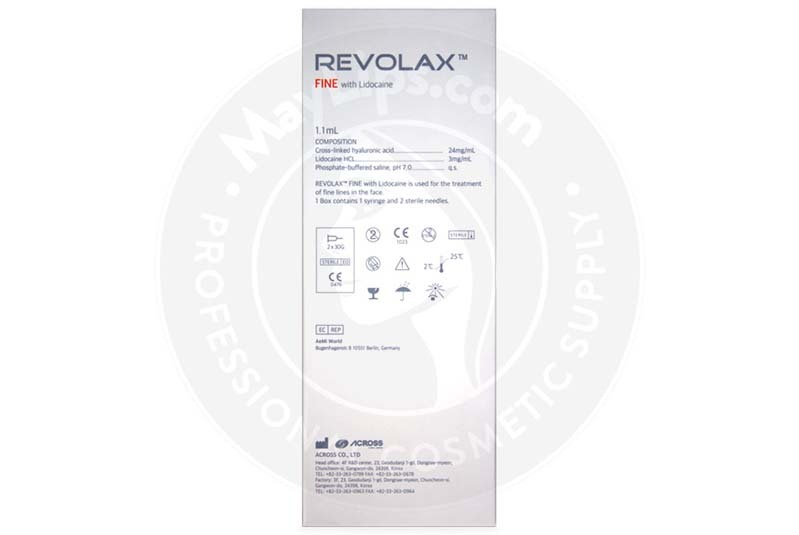 Since Revolax Fine with Lidocaine is made of cross-linked hyaluronic acid filler, the cohesive, smooth, and uniform filler gel is able to resist premature degradation for about 12 to 18 months before being resorbed into the nearby tissues. This long duration of action is made possible by the dense, cross-linked mesh structure of the gel, which protects the filler against enzymatic decomposition and free radical damage. The exact residence time of the filler varies on an individual basis. Patients who are pregnant or breastfeeding. Revolax Fine with Lidocaine must also not be used alongside other dermal treatments like dermabrasion, laser therapy, and chemical peeling treatments. Immediately after a treatment session, patients may display injection site reactions, such as redness, swelling, and bruising. These inflammatory reactions are usually mild in nature and short-lived. Refer to the package insert for a detailed list of side effects. Patients must be educated on all potential adverse reactions so that they can get swift medical attention if required. 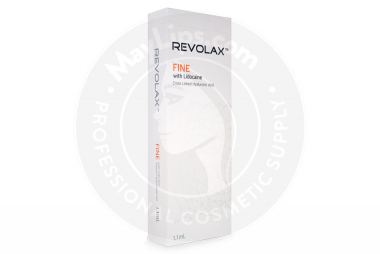 Revolax Fine with Lidocaine is a completely biodegradable and synthetic dermal filler that is made of highly pure hyaluronic acid. It contains 24mg/mL of cross-linked hyaluronic acid that is incorporated with 0.3% lidocaine so that patients remain comfortable and free from pain during treatment sessions.